to use in a “HE” (high efficiency) washing machine? The short answer is YES. It’s fine in HE machines. 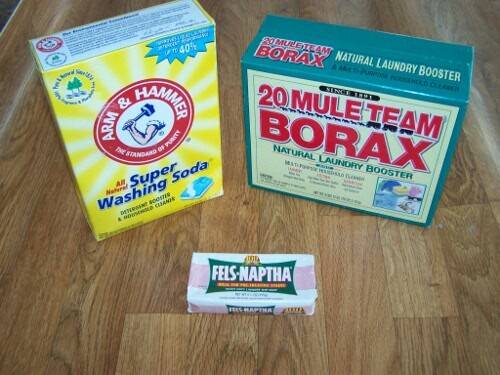 The HE machines need low suds detergent and this recipe creates very little suds. Hi I’m just wondering about smell. Part of clean laundry is clean smelling laundry….does this have that? If not can things be added to improve the smell to make good smelling clothes? I would say that generally it would be considered “unscented” (at least when compared to the smelly big brands). I’m sure there is something you could put in to give you that laundry perfume smell, but one of the reasons I like to make soap is to get away from all those unneeded chemicals. I’m afraid I’m not much help on this one. By the way, I LOVE your name. Any kind of essential oil would do the trick Fels Naphta has a citrus smell to it if you don’t like it then try Zote its has a more floral scent i don’t like as many chemicals in it either but I prefer making it more because it is way cheaper then purchasing it. I usually grind a cup of Purex crystals and add it too. I also usually do the dry version as well combine grind and one to two tablespoons per load, but if the liquid works well if you want a more concentrated you can usually dilute the recipe up to a 5 gallon container. Hi, can you use castle bar soap instead of the Fels? I’ve never tried it myself, but I have friends who have. They say it works fine. I kind of like the smell of the fels myself. Hi Karl, just wondering if this could be also just used as a powder? I have used liquid washing machine detergent in past and found it too gloopy and my son doesn’t like using it. If I made this a liquid and added an essential oil could this be a dish detergent too? I’m waiting for my moulds to arrive and then I’m giving your soap recipe a go, I want to make the soap and liquid body wash and washing detergents. I have found your site a valuable tool and really easy to follow recipes. All the way from Australia- G’day mate! I know someone who makes their own powder soap, but I don’t believe this recipe is well suited for that purpose. I also wouldn’t recommend it for a dish detergent. Glad you have found my site useful! from USA- Catch y’all later! When I make my laundry soap I use Castile Soap and hot water with essential oils like Lavender or Eucalyptus. I boil 2 cups of water in my tea kettle, and while the water is boiling I cut one bar of soap and add it to a mason jar. When the water is nice and hot I pour it into the mason jar, be careful because it is VERY HOT! I will use a spoon to stir the water to help break down the soap. Then I add several drops of essential oil for a nice aroma. The jar goes a long way and here in Michigan (at Meijer) we can get 3 bars of soap for 3.59, however now that I have learned how to make the soap, I can save even more and make more too! After i followed your recipe, the next day may soap wasn’t thick or gooey like laundry soap is. As a matter of fact, it has separated at the bottom of the bucket. I stirred it up, yet it never thickened. It still is watery. Not sure what happened. the only thing that i can think of is that i let is sit in a cold basement, so not sure if the temp had something to do with it. I will try it again this eve and let it sit upstairs overnight. This detergent can separate. I just shake it up before using it.